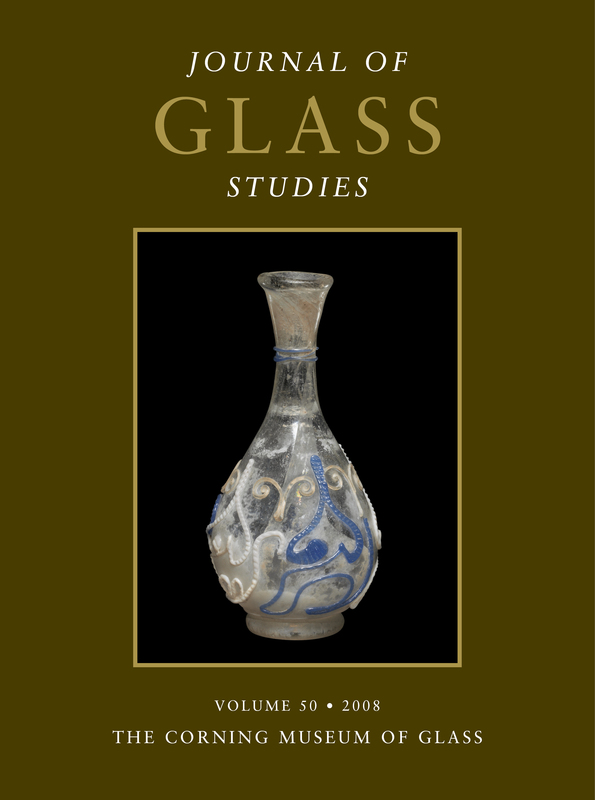 In this volume, David Whitehouse marks a half-century of glass research with a look back at the founding of the publication. Also included are an illustrated catalog of early Islamic gold sandwich glass in The Corning Museum of Glass; a pair of accounts of early glassmaking in Israel; and two new looks at the Hope Goblet. Also in this volume is a listing, with pictures, of recent important acquisitions. A painted bowl from a private collection is part of a well-known series of bowls of Isings form 12, but its decoration makes it an exceptional piece. It is composed of several Nilotic elements: a person operating an Archimedes screw, a reed cabin, and an ithyphallic dwarf bearing a pole who is running away from a grotesque individual offering him some wine. Each of these features has parallels from Hellenistic Egypt and from early Roman paintings and mosaics that help to demonstrate how the painter has used ethnic elements to create a burlesque scene. In the late Roman period, there was a limited production of glasses with snake-thread decoration in the north of France. This article presents all of the available information on this industry. The forms, decoration, and origin of the objects are discussed, as well as dating by associated pottery and coins. A bibliography of the objects is provided as well. At the end of the study is a catalog with drawings or photographs of the known 26 objects. Some of these objects have been lost, but many are preserved in various collections. The use of glass for wall coverings in late antiquity is well documented in southern Gaul. Although none of these coverings was preserved in situ, evidence for this type of decoration is provided by glass mosaic tesserae and especially by cakes of colored glass and cakes of yellow-green glass with a thin layer of gold foil sandwiched between the two layers. This evidence comes primarily from aristocratic residences of Aquitania, in which mosaic floors were executed by artisans in traveling workshops that stocked special materials that were not readily available locally. The glass cakes were probably imported the same way. Mosaic cubes were also made from colorless chunks of raw glass. These glass wall coverings were not made exclusively of mosaics. Another type of decoration, produced with small, thin plates of gold glass, is found in four Christian buildings in Aquitania. Inscribed gold glass is a third type of wall covering made of glass. This article supplements an earlier contribution to the Journal of Glass Studies (v. 46, 2004, pp. 51–66) and attempts to verify, by archaeological evidence and chemical analysis, the assumption that late Byzantine Apollonia-Arsuf was a major center for the making of both primary and secondary glass in the sixth and seventh centuries. Excavations (carried out in 2006) in the newly opened Area M at the site unearthed a dump of that date, in which considerable numbers of raw glass chunks and fragmentary glass vessels were recovered. In the newly opened Area O, the remains of another raw glass furnace were discovered, which brings the number of late Byzantine raw glass furnaces found at Apollonia-Arsuf to four, being the only primary glass installations in Palestine that have been confirmed as operating in the late Byzantine period. The various tanks produced glass of similar chemical composition, using the same recipes and the same raw materials. Glass vessels from Area M show a relatively tight compositional cluster, suggesting that they were produced in a single workshop. Chemical analysis strongly suggests that the raw glass produced at the site was also used to make the glass vessels that were found there. To date, only Apollonia-Arsuf has yielded evidence, although indirect, for the coexistence of primary and secondary industries in Palestine. This article discusses debris from a secondary glass workshop at late Byzantine Ramla (South), Israel. The debris consists of fragmentary glazed and unglazed fired mud bricks that probably formed part of the workshop’s furnace, and glass refuse—raw chunks and lumps, moils, waste, and fragmentary vessels. Chemical analysis shows that the vessels and the raw glasses have similar compositional ranges and present the same evidence of unusually extensive contamination by fuel ash. It is suggested that all of the analyzed glasses—chunks, vessels, and moils—came from a single contaminated tank of glass that was employed during a relatively short period. The glass from the debris is typical of Byzantine-Islamic natron-type glass from the Levant. The debris is dated to the sixth and seventh centuries, based on pottery and glass vessels that were found at the site. The remains of late Byzantine pottery kilns found there indicate the coexistence of two fire-dependent industries. In 1964, The Corning Museum acquired a gold sandwich glass cup that was believed to be Parthian or Sasanian. The cup and a fragment of gold sandwich glass were described as Parthian and Sasanian in two exhibition catalogs published in 1967 and 1972. This attribution was challenged in 1978, when The British Museum acquired a bottle with very similar decoration, but of a form that is typical of the early Islamic period. The view that these objects are Islamic was confirmed 10 years later, when the David Collection purchased fragments of a related bowl bearing an imitation of a Kufic inscription. Today, we are aware of 10 vessels or fragments of vessels with gold sandwich glass decoration, sometimes accompanied by dots of blue enamel, all of which may be attributed to the ninth or 10th century. This article discusses the objects and provides an illustrated catalog of the five examples in The Corning Museum of Glass. An elaborately crafted opaque white Venetian glass goblet, decorated with colored striations and dating to the second half of the 16th century, was uncovered during an archaeological excavation in Ferrara. Chemical analysis of a few small fragments revealed the composition of the glasses and identified colorants and opacifiers. The results were compared with historical sources and Venetian recipe books of the 15th to 17th centuries. This investigation sheds new light on the evolution of Venetian glassmaking technology. The goblet was made of opaque white glass with calcium antimonate (replacing lead and tin calx), aventurine glass, and copper ruby glass, which at that time had probably been used for only a few years in Venetian glasshouses. Furthermore, the analysis confirms the use of a cobalt mineral from Saxony to make the blue glass, as well as the use of a purified soda-lime glass (crystal), in accord with recipes recorded in historical documents. This article presents a detailed discussion of the engraved glass panels of the “Heiltumskasten,” a reliquary shrine in the Reiche Kapelle (rich chapel) of the royal residence in Munich, Germany. The shrine was commissioned by Duke William V of Bavaria (r. 1579–1597), probably in the 1580s, and transferred into the Reiche Kapelle between 1607 and 1611. The panels are among the earliest known modern glass engravings, and they are among the best ever made in terms of their artistic and technical quality. Yet they have received very little attention because the chapel was not open to the public before 1939. The panels follow designs by the court painter and architect Friedrich Sustris (about 1540–1599), but unfortunately, the artist who engraved the panels is unknown. The author also discusses other glass engravings from the Reiche Kapelle and considers the hard-stone engravers Zacharias Peltzer (active in Munich 1584–1596), Mathes Hämerl (active until 1631), and Valentin Drausch, who worked for the courts in Munich, Dresden, and Prague. This article presents an analysis of chandeliers made at the Nøstetangen glassworks at Hokksund. This glassworks, the first established in Norway, was in operation from 1741 to 1777. Previous research on this subject concentrated mainly on stylistic features. This article considers aspects of craftsmanship, as well as the methods and tools used in producing the constituent parts. An attempt was made to differentiate between original pieces and later copies, and to classify them accordingly. Chemical analysis of the glass was subsequently performed to see if the results would support the initial classification and prove that the various categories of parts contained different compositions. Four different glass compositions were identified. To a large extent, the initial classification did correspond with the results of the chemical analysis, and parts that were first classified as “uncertain” were found to belong to one of the four compositions that were identified. The Hope Goblet entered the collections of The British Museum in 1894. It was at one time considered to be an example of the so-called Syro-Frankish enameled vessels. More recently it has been considered a forgery, probably made in the last quarter of the 19th century, shortly before it was purchased. Technical analysis suggests that many aspects of the vessel are consistent with manufacture before that time. While it may not be a medieval artifact, it is unlikely that it was made to deceive. The Hope Goblet in The British Museum was once well known as a rare and important enameled glass dating from the Middle Ages. But as more and more fragments of medieval enameled beakers of the Aldrevandin type have been excavated in recent decades, the authenticity of the Hope Goblet was called into question. It was eventually declared by Hugh Tait to be a fake. While the results of analyses (see pages 163–169) indicate that this beaker was not produced in the late 19th century, art-historical arguments exclude a medieval origin. The most plausible background seems to be the time of the early Gothic Revival (later 18th to early 19th centuries). The Hope Goblet may have been intended to be mounted as a chalice, as a Christian counterpart of “Christianized” Islamic glass beakers on high, chalice-like feet. The Glass Museum of Murano preserves some panels with filigree canes (two of them with aventurine threads), millefiori canes, murrine, and inlay work. The panels are titled “DOMENICO BUSSOLIN in VENEZIA – Medaglia d’argento Esposizione Industriale 1842,” which has prompted scholars to believe that they were made in that year. Although Bussolin won a silver medal in the Venetian competition of 1842, he had been making enamels and “conterie” for many years (he also attempted to open a factory for their manufacture in Greece and perhaps in Silesia), and the panels were probably produced later. In 1868, Bussolin presented millefiori canes that had been handmade (not lampworked) in a glass factory, and it is likely that such canes are contained in the Glass Museum’s panels. However, it appears that another glassworker, Ongaro, who worked for Bigaglia in Venice, had made millefiori canes even earlier, and that he attempted to create canes with figures. After a hiatus of about eight years, from 1896 to around 1904, the Smithsonian Institution resumed active collecting of contemporary American glass. This venture was stimulated by the promise of a new museum building that was expected to ease the desperately crowded storage and exhibit space, and by the prospect of collecting opportunities at the Louisiana Purchase Exposition in St. Louis in 1904. This is the second of three articles on the collecting of American glass at the Smithsonian. It covers the period between 1904 and 1917, which featured a growing emphasis on the acquisition of educational materials—such as scale-model glass furnaces and tools of production—along with samples of the glass itself. Donations were received from the Libbey, Union, and Fostoria glass companies. In 1914 and 1915, the Macbeth-Evans Glass Company donated hundreds of pieces, and George Macbeth worked closely with the Smithsonian’s curator to create a heavily technological exhibit, the first in a series for the museum’s new Division of Mineral Technology. In 1917, C. Dorflinger & Sons Inc. donated examples of tableware, colored glass, and glasses that illustrated the technique of cutting. The sunken firing chambers of Roman glassworking furnaces are well known from archaeological excavations, but little is known of the form of the superstructures or of the functioning of these furnaces. In 2005 (with funding from English Heritage) and 2006, two wood-fired furnaces based on excavated Roman examples were built and used to work glass for three-week sessions, and one furnace was rebuilt for the 2006 session. The goal was to test several designs of furnace superstructures and methods of containing molten glass, and to establish their suitability for glassworking. In addition, two lehr designs were tested: one was connected to one of the furnaces, and the second was independent of the furnaces. This article discusses the construction and performance of each furnace and lehr, based on fuel and temperature data collected, and assesses the individual design elements of each structure. This article describes various types of waste produced in experiments conducted by Mark Taylor and David Hill, using replica Roman glassworking furnaces. The material produced is compared with archaeological glassworking waste, with the aim of facilitating the interpretation of the latter. The results emphasized the importance of taking into account the reactions of the alkali- and sulfur-rich waste gases and the lime-rich ash produced by the wood fuel when interpreting archaeological material. These by-products reacted with the pots holding the glass, the internal surfaces of the furnace, and, in some circumstances, the glass itself. Over prolonged periods of time, the fuel waste gases were found to influence the composition of the glass that was being melted. The fuel ash influenced the composition of glass waste accidentally deposited in the ashpit. The results also have implications for the reuse of fuel ashes as a raw material in glass production.